Photos By: Sol Tucker and Benjamin Rogers Jr.
Kyle Busch Jumps Out at the Finish Line to Celebrate his Victory at Martinsville. Coming into the weekend at Martinsville, Kyle Busch wasn’t the heavy favorite to win the truck series race let alone both races, well after today’s STP500, that drought is long over and the JGR car who led the most laps at Martinsville since 1998 has found a way to tame the track that has eluded him for some time now. On Sunday, a caution reset the field with 34 laps to go and again with 11 laps remaining as drivers began swapping paint as the race winded down. Matt Kenseth joined Busch on the front row for the final restart, but with old tires and an outside position, he dropped 14 spots for a 15th-place finish. Joey Logano, the pole-setter and Kenseth’s rival after an intentional crash last November at Martinsville, led just 21 laps and was a lap down at one point in the race. He finished 11th. AJ Allmendinger tied a career best at an oval with his runner-up finish, while Kyle Larson, Austin Dillon and Brad Keselowski rounded out the top five. “Its a great feeling to come in here and win this clock, seems like it was such a long time coming, We used the truck race to study the track and it paid off today. I give a lot of credit to this JGR team, they did a lot to make sure this car was right today said,” Busch. Busch has now won at every track on the circuit except for Charlotte Motor Speedway, Kansas Speedway and Pocono Raceway. Busch chose the high line on the final restart with 13 laps to go and sailed past Joe Gibbs Racing teammate Matt Kenseth. 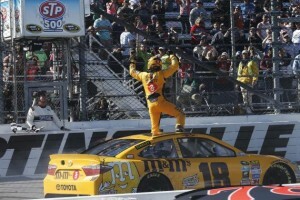 He also probably locked up a spot in the Chase for the Sprint Cup and will have a chance to defend his title. Another great finish came from Kyle Larson, who had his best finish in five career Cup starts here.